At the moment I am writing an introductory Mathematica course and was recently looking for inspiration for potential exercises. One website I came across (I have lost the link unfortunately) suggested that you get something interesting looking if you plot the following equation over the region -3<x<3, -5<y<5. It also suggested that you should only plot the z values in the range 0<z<0.001. Suitably intrigued, I issued the required Mathematica commands and got the plot below which spoke to me in a way that no equation ever has before. So now I have a question – What other messages could one find hidden inside equations like this? For example, is it possible to generate a three letter word with a relatively simple equation such as the one above? Of course if you were allowed to use very complex equations (and make use of Fourier transforms maybe) then I guess you could spell out whatever you choose but that’s no fun. If anyone finds other such messages in simple(ish) equations then please let me know. Like it! I suppose it’s a new take on “Hello World” for the advanced user! have you plotted its derivative? It’s like a really advanced version of writing “hello” on a digital calculator. If I’m reading right, the formula actually plots itself. Hope you like. 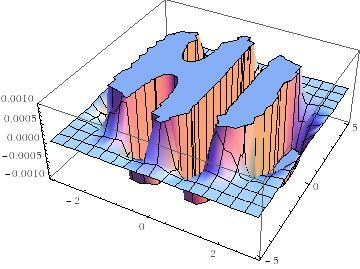 I guess that it should be possible to do on MATLAB. You have to scroll down a little first. It is definitely an interesting thought towards the realm of steganography :) Not quite encryption/cryptography, but very interesting. I am also interested in using infinite (transcendental) sequences as keys or for hiding messages if given offsets (similar to knowing the x,y,z ranges to plot). For easier viewing paste each letter individually. According to the mathworld page you linked to ‘The formula itself is a general purpose method of decoding a bitmap stored in the constant k, so it could actually be used to draw any other image’.